Santa Maria Maggiore stands on the site of a temple to the goddess Cybele. According to a 13th-century legend, the first church was built here by Pope Liberius (352-66), on the site of an apparition of the Blessed Virgin Mary. The legend has it that the Virgin appeared to Pope Liberius and the patrician Giovanni Patrizio on August 4, 352 (or 358), instructing them to build a church on the Esquiline Hill. That night, the floor plan was outlined by a miraculous snowfall. The church has had many names over the years: first Santa Maria della Neve (St. Mary of the Snow) after the snowfall, then Santa Maria Liberiana after Pope Liberius. After the basilica obtained a relic of the Holy Crib, it was called Santa Maria Del Presepe (St. Mary of the Crib). It was finally named Santa Maria Maggiore because it is the largest of the 26 churches in Rome dedicated to the Virgin Mary. 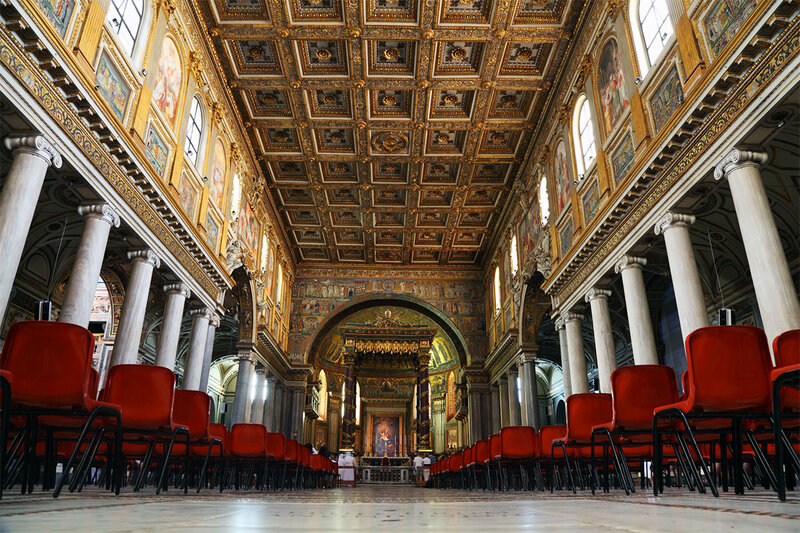 The interior of the basilica preserves its majestic Early Christian form, which was standard in Rome in the 5th century: a tall, wide nave with side aisles and a round apse at the end. The 5th-century mosaics on either side of the nave depict scenes from the Old Testament. This was the first large-scale cycle of Biblical scenes in Rome. The left-hand side has scenes of Abraham, Jacob and Isaac; the right-hand side has scenes of Moses and Joshua.The golden mosaics of the triumphal arch are also from the 5th century and depict scenes from the early life of Christ. The imagery of these mosaics is rich and complex and the details have been interpreted in various ways; the second woman in the Epiphany scene, for example, has not been certainly identified. The scenes are as follows: The apse mosaic, depicting the Coronation of the Virgin, is from the late 13th century, by Franciscan friar, Jacopo Torriti. The loggia above of the main entrance contains 13th-century mosaics, but is not always open. The Athenian marble columns supporting the nave are the oldest parts of the church – they either come from the first basilica or from an antique Roman building. However, the shafts were reworked and the old capitals and bases were replaced during a restoration of the 18th century. The medieval bell tower is the highest in Rome at 240 feet, (about 75 m). The floor of the church is paved in opus sectile mosaic, featuring the Borghese arms of an eagle and a dragon.